The holiday apartment is situated in Hinterthal to about 1 020 m altitude. Parking by the house. Self-catering, part antique furnished apartment, balcony, fireplace, luxury bathroom with jacuzzi, central location, hotels, restaurants, bars, wellness facilities, and ski lift within walking distance, high-king top ski ADAC 2011 winter and summer, cross-country skiing and hiking paradise, Salzburg 40 minutes to Saalfelden 20 minutes to Maria Alm 12 minutes. Great joy in the Region High King, for the ADAC ski guide chose our ski resort in the category 'Top Movers' to the ski of the year 11/12. Winter: The idyllic village Hinterthal is at 1020 m above sea level, nestled amidst pristine natural landscape against the backdrop of the stone sea and the High King. The fantastic vacation region Hochkönig Maria Alm extends from the towns behind and Hinterthal on Dienten to Mühlbach am Hochkönig. We are thus in the center of Hochkönig and High King Mountain Kingdom. With the fantastic snow conditions in Hochkönig everyone can fulfill his personal dream winter. Whether conventionally on two skis, rather in the halfpipe on a snowboard or a ski tour away from any other - plenty of well-groomed slopes, modern lifts and a fantastic powder snow, there are plenty of variety. Either cross-country skiing, skating, hiking through snowy woods or better on the ice. Summer: Here in the Hochkönig mountain kingdom of nature shows as a fabulous holiday landscape in which you can not help falling in love. The natural hospitality of the locals, the high comfort of the living and the natural, incredible scenery around the Hochkönig leave lasting impressions. Surrounded by forests, this spot offers the ideal blend of tranquility and activity. Far away from large tourism flows can expect a varied selection for something other hiking, biking and family vacations. In Maria Alm Guests are offered a wonderful adventure is available and while the kids enjoy the children's camp, the Great, the hiking and mountain tours on Aberg to high-king fully enjoy. Experience the particularities of the region, its monuments, traditions and customs, not least the Almschmankerl. Two-thirds of our guests are already regulars! Washing machine and dishwasher are in the apartment, as well as a Sony Bravia TV with cable channels (digital and HD channels). Wireless internet is included. Wellness oasis bathroom! A fee-dryer are in the basement community. 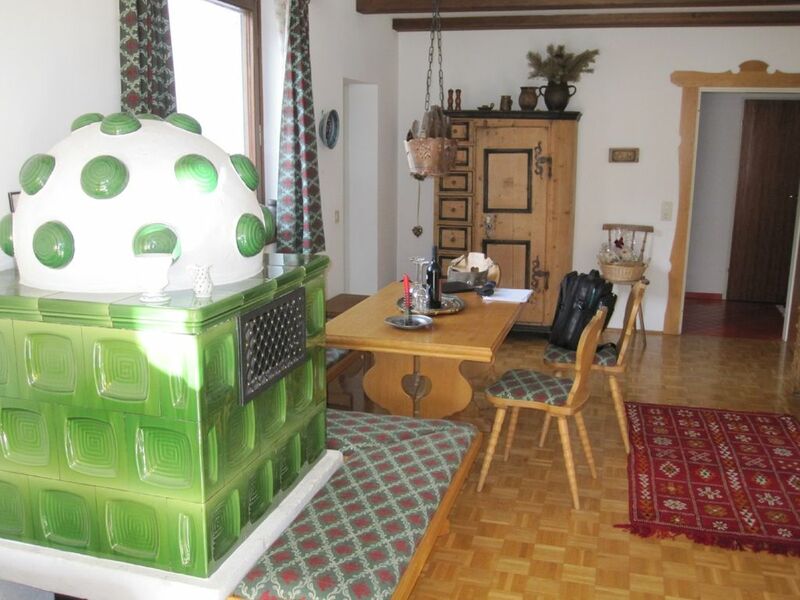 Very spacious apartment, within walking distance to the slopes of the Hochmais. Excellent, modern bathroom with Jacuzzi bath and steam shower. Comfortable bed and furniture in the living room, with a balcony looking out on to the Hochmais. Skit storage room downstairs and plenty of parking. Easy to walk to all bars & restaurants and would definitely use again when we come next year. Many thanks for this positive evaluation: glad you enjoyed it! Die gemietete Wohnung ist super ausgestattet, besonders die Küche. Alles da! Auch der Whirlpool wurde genutzt. Die Nähe zum Skilift im Winter und zu den Wanderwegen im Sommer ist perfekt. Das gastronomische Angebot des Ortes ist ausreichend und abwechlungsreich. Vielen Dank! Es freut uns sehr, dass Sie zufrieden sind! Appartement Bergklang ist super und komplett. Die Wohnung ist mit allen Annehmlichkeiten ausgestattet. Vielen Dank ! Das freut uns sehr ! Es ist eine sehr schöne Ferienwohnung!!! Uns hat es sehr gut gefallen.Alles sehr großzügig angelegt. Ferienwohnung war wie abgebildet und es war wirklich alles vorhanden. Nach einem Skitag ist das Wellnesbadezimmer sehr entspannend (Whirlbadewanne oder Dampfdusche). Kachelofen ist leider nur eine getarnte Nachtspeicherheizung und dient mehr der Deko oder hilft bei extrem kalten Außentemperaturen. Kommunikation mit Dafydd war problemlos und Schlüsselübergabe vor Ort auch sehr unkompliziert. Hinterthal hat leider keine Geschäfte, aber zumindest eine sehr nette Dorfkneipe und ein paar Restaurants. Entspannung findet man dort auf jeden Fall. Diese Wohnung ist eine von 21 in diesem Haus, in der Umgebung gibt es noch viele Häuser dieser Art. Der Eigentümer vermietet seine Wohnung wohl nur im Winter. Die Lage zum Lift macht die Wohnung für jeden Ski Urlaub perfekt. Wir waren zu zweit, hatten genügend Platz in jedem Raum. Wie man aus der Dusche Wasser aus der Brause und den Düsen an der Wand bekommt, konnte uns niemand sagen und wir haben es in 7 Tagen auch nicht geschafft, das Farbspiel funktionierte nicht. Dampffunktion war in Ordnung, doch wer will so lange im Dampf stehen? Ein Hocker wäre von Vorteil. Wirlwanne darf nur mit klaren Wasser betrieben werden, man muß nicht auf Sprudel schalten, ist eh laut. Wohnung war sauber, es gab nichts zu bemängeln. Die Bilder entsprechen dem Original. Die antiken Möbel sind sicher sehr wertvoll, man vermutet in diesem Haus keine so gemütliche Wohnung. Dusche und Bad Gebrauchsanweisungen stehen im Hausbuch zum allgemeinen Durchlesen bereit. Andre Gaeste haben keine Probleme gehabt. Golf: In a quiet and natural landscape, at the foot of the towering mountain range of the stone sea, is one of the finest championship golf courses in the Alps. The golf course Urslautal, situated on a plateau between Saalfelden and Maria Alm, fits perfectly and seamlessly into the given landscape. Ski: In the heart of Salzburg, around the High King, is one of the most beautiful family holiday destinations in Europe. Winter fun, snow from Christmas to Easter. 150 km best prepared slopes with 39 lifts in conjunction with Ski amade` 5 regions, 25 locations and 860 km of slopes. Whether skiing, snowboarding, cross-country skiing or snowshoeing for each is well taken care of. Ski schools and ski kindergartens ideal learning terrain for all ability levels.